NEW YORK, New York - ​​If you didn’t get a chance to read Jason Whitlock’s article on the racial composition of the Dream Team, you can read it right HERE. If you’re like me, a true basketball fanatic, your blood pressure will start to rise just a few paragraphs in. In the article, published on FoxSports.com, Whitlock states that the Dream Team, which had 8 black players and 4 white players, was “color coordinated,” basically because Isiah Thomas did not make the squad. He says the “whitening of the roster” was both “intentional” and “calculated,” and that players like Isiah, Dominique Wilkins, James Worthy and Shaquille O’Neil, were left off the roster for lesser quality, white players like John Stockton, Chris Mullin and Christian Laettner. Whitlock’s arguments in support of his positions are borderline moronic. Yep. I wrote it. I believe it. I know it. If you’re not familiar with the theory behind the Dream Team, here is a little background. In 1989, FIBA opened the Olympics up to professional players. After coming in a disappointing third in the 1988 Seoul games featuring all college players, USA Basketball decided to form a team made up of 11 professional players and 1 college player. Whitlock says that there was no way USA Basketball was sending Larry Bird and 11 black players to Barcelona, so they essentially just needed to add some more white players. That’s where Stockton, Mullin and Laettner come in. The first debate is whether Shaquille O’Neil should have been named to the team over Laettner. The final spot on the Dream Team was held open for the best college player in 1992. I’ll repeat that because I’m not sure Whitlock understands the premise behind the choice: the best college player at that time, that time being 1992. It was not being held for the best college player with the most professional potential. So let’s get real. During the 1991-1992 college basketball season, Christian Laettner was the BEST college basketball player in the country. It does not take much to support this argument. Laettner played 4 seasons in college. He compiled a career record of 123-26. He played in 4 Final Four’s, 3 National Championship games and won 2 National Championships. His senior year, 1991-1992, Duke went 34-2 and Laettner averaged 21.5 ppg, 8 rpg and hit 56% of his three-point attempts. He’s the all-time NCAA Tournament leading scorer. He was selected to the Dream Team because he deserved to be there. No other reason. Whitlock contends that Laettner didn’t belong because Shaq was a “once-in-a-generation force of nature destined for hoops immortality.” But he wasn’t in 1992. That year he averaged 24.1 ppg on a 21-10 LSU team in a weak SEC. Looking back now, twenty years later after both NBA careers are over, it seems comical. Just like picking Sam Bowie with the #2 overall pick in the NBA Draft ahead of the skinny kid from Chapel Hill is laughable now. But it made sense in 1984. Just like selecting Laettner in 1992 over Shaq. In fact, at that time, it shouldn’t even have been close. Laettner was far and away the better college player. Next, Whitlock suggests that “anyone with a brain realizes that [Isiah] Thomas was a better player than [John] Stockton.” In support of that he points to the fact that Thomas won 2 NBA Championships, and played for a third, without the luxury of playing alongside another all-time great, an obvious reference to the fact that Stockton played his entire career pick-and-rolling with Karl Malone. He’s right in respect of the fact that Thomas didn’t have another all-time great to play with. What he did have, however, was one of the all-time best defenses in the history of the NBA. A defense so good, so dominant, that it had its own nickname, the Bad Boys. So while he didn’t have a Malone, or a Pippen, or a Kareem, or a McHale and Parish, he did have Bill Laimbeer, Dennis Rodman, Joe Dumars, Rick Mahorn, John Salley and Vinnie Johnson. Isiah didn’t win those 2 titles by himself. No chance. And Stockton? He’s only the all-time assist leader for the league with 15,806. He also made the First-Team All-NBA twice and the All-NBA Second-Team six times. Oh, and he was a ten-time All-Star. Not a shabby resume by any means. And let’s not forget the most important reason why he was selected: Stockton was put on the team as the back-up point guard to Magic Johnson. Someone who could dish the ball to MJ and Larry and Barkley and David Robinson and Ewing and Pippen. They needed to balance out the team by adding a second ball handler. Stockton was the wiser choice over Isiah, who was a scoring point guard, due to the fact that the Dream Team already had plenty of offensive weapons. Lastly, Whitlock criticizes the choice of Chris Mullin over Dominique Wilkins. Now, just as in the choice to add a back-up ball handler to the squad, the Dream Team logically included Mullin over Wilkins for his outside shooting ability. Other than Larry Bird, there would have been no other outside shooter on the team had Mullin not been selected. In a mocking tone, Whitlock says, “There wasn’t an international zone invented that could stop Jordan, Barkley, Robinson, Ewing, Malone, Pippen, Bird and Magic in 1992.” Suggesting that Mullin’s outside shooting ability wasn’t necessary for the Dream Team to be successful. That’s absolutely true. But, now, let’s use Whitlock’s idiotic reasoning against him: the Dream Team won all their games by an average of 44 points – did they really need Scottie Pippen on the team? What about Barkley? 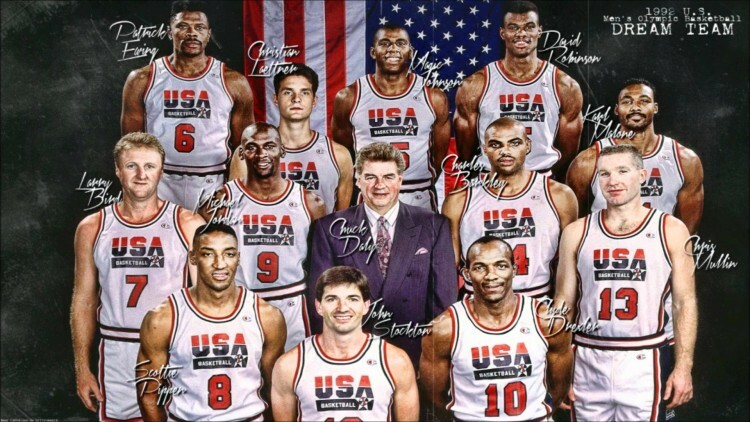 Clearly, the Dream Team still would have won the gold medal if Barkley was kept off the team. They also would have won if Pippen or Drexler, or even Malone, had not made the trip to Spain. Mullin wasn’t selected IN CASE they needed an outside shot. He was selected to form the greatest sports team ever assembled and to achieve that, it had to be well-balanced. And to balance off that squad, they needed another outside perimeter threat and, in 1992, that was clearly Chris Mullin, one of the greatest shooters of all-time. And what exactly would Dominique Wilkins have brought to the team? If there was a dunk contest for a medal, I would absolutely say he needed to be there. But other than some highlight dunks, which Whitlock references as his “imprint”, what would he have contributed? I would like for Whitlock to answer that because as a professional sports writer, I think he loses any and all credibility with me for making that argument. Wilkins essentially was the same type of player as MJ, Pippen and Drexler, except NOT AS GOOD. So why did they need a fourth option for an alley-oop? They didn’t and that’s why he wasn’t on the team. If Chris Mullin was a poor man’s Reggie Miller, as Whitlock suggests, than Dominique Wilkins was a welfare recipient's Michael Jordan. The 12 players chosen for the Dream Team were selected because they made up the greatest, the most well-balanced sports team that would ever be assembled. And that team was created so the rest of the world remembered that the United States of America was the absolute pinnacle of basketball. The team was created to teach the world a lesson and to make sure other countries were not getting too cocky about their skills and their level of play. No one was upset that John Thompson’s 1988 Seoul team was not white, they were upset because they were not good, leaving the Olympic Games with a third place medal. 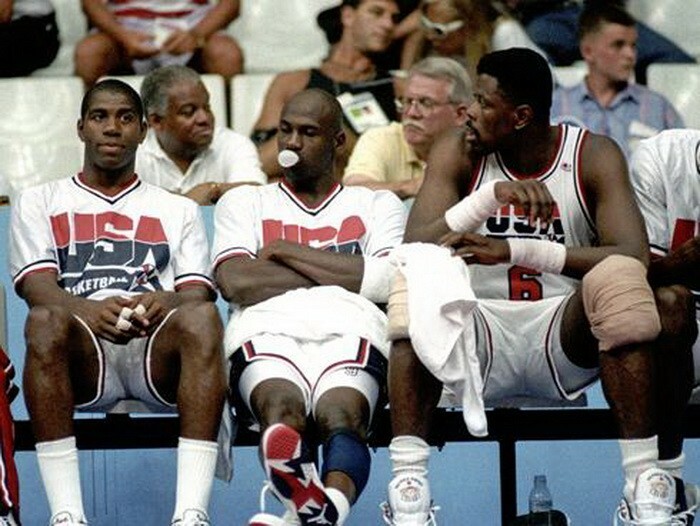 The only agenda with the formation of the Dream Team was to dominate. And that’s exactly what they did. Any reference to the racial composition of that team, and to any underlying plan to "whiten up" the roster, is just a ploy for attention from a writer that has now lost my readership. Yep. I wrote it. I believe it. I know it.